How can prayer become an integral part of family life when schedules are often so hectic? I wish I could say that prayer is woven into all aspects of my life. But like many people, I’m continually challenged by Ephesians 6:18, to “pray in the Spirit on all occasions with all kinds of prayers and requests”. I would love my life to look like this, that consistent knowledge of the Holy Spirit with me, to talk to, to follow His prompting and hear His voice. Not only do I want prayer to increasingly be part of my own life, but for my children as well. I really want them to learn to delight in being with God, being able to chat to Him and hear from Him at any time. But life as a mum, dad or carer can be hectic. I often add ​‘prayer’ to my to-do list as though it needs to happen at some point and be ticked off, rather than viewing it as an essential ingredient to everything that happens in our family life. The Kitchen Table Project’s Inspire session, which aims to get mums and dads thinking and talking about how to inspire a faith that lasts in our children, helps. It picks up on the challenges that families face with the fast pace of life, trying to fit in work, school and extracurricular activities, as well as a bit of down time. Inspire is a video-based small group resource that provides time to talk through the obstacles and opportunities that we have to overcome and grasp in order to help our children grow in faith. I love being able to discuss honestly and openly about how hard parenting can seem at times, yet the session gives such down to earth and simple tips, that it really does make nurturing faith seem like something that can be integrated into family life. The key to the whole session is that our own efforts really need to be underpinned with prayer. God loves our children even more than we do and longs to partner with us to see them enter into their own journey of faith. There is something significant about not only consistently praying for our children, but with them as well. Not only can prayer strengthen our family relationships, but it will draw us all into closer relationship with God. 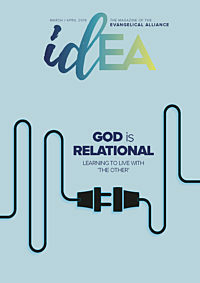 Some of the discussion points look at how we best connect with God and recognise how our children might connect with Him too. It’s fascinating to think about what ​“praying in the Spirit on all occasions” might look like for our individual families. It could be when out on the walk to school or playing in the woods and taking those opportunities to praise God for His creation, or maybe it’s in the conversations about science lessons. Finding the times that could provide natural opportunities to pray helps our children to understand that it’s not just for Sundays or before going to bed. It introduces the concept of continual communion with God. When we start thinking intentionally about praying at all times, it becomes normal to thank God when something good happens, to ask Him for wisdom when we’re confused, or to comfort us when we’re upset. And if I can do that out loud in the home too, then it is a practice that my children will pick up on. I can encourage them to pray with us about family decisions, helping them understand that they can hear from God just as much as we can. Not only can prayer strengthen our family relationships, but it will draw us all into closer relationship with God. One mum, Claire, shared that around the same time as running an Inspire session a group of Christian mums from the same school decided to start praying for their children and the school once a month. They kept this going in the school holidays and brought their children in too. It became a fun play morning building the school out of bricks, using toy people to depict friends and teachers, and then praying for them while playing. Claire said: ​“It has not only helped me to be more intentional in praying for my children, with the group and on my own, but it has allowed me to build relationships with other mums and dads from different churches across our city. Being able to listen to other parents’ highs and lows, and to share ideas with each other, has really helped to realise that I am not the only one to find parenting challenging at times. How could prayer be a natural part of life for your family? Have fun thinking about the opportunities that will work for you. If you would like support, you can download the Inspire session free of charge or look into other resources and guidance offered by the Kitchen Table Project. Additionally, the Raising Faith event tour provides parents with tips on how to help their children build their trust in God and useful ideas that they can put into practice straightaway. For November tour dates, venues and information on how to book, click here. Becky Denharder is a project manager at Care for the Family.